Lake Country HD Orbital Foam Pads are specially designed foam pads that were developed for long-stroke dual action polishers. Lake Country HD Orbital Foam Pads feature a dual-density design. This unique design eliminates the concaving effect that other pads experience, allowing the pads to maintain optimum surface contact and extended usage on long-stroke machines. Lake Country HD Orbital Foam Pads will outlast and outperform any other foam pads on a long-stroke dual action polisher – guaranteed. 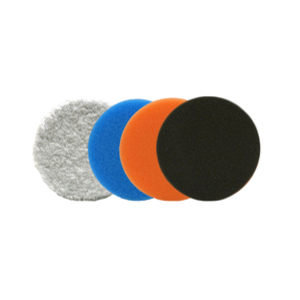 Microfibre Heavy Cutting HD Orbital Pad - Features a microfibre nap that removes heavy imperfections from your painted surfaces. Like other microfibre pads, it has enough to remove moderate to severe paint imperfections, but finishes like a foam pad. 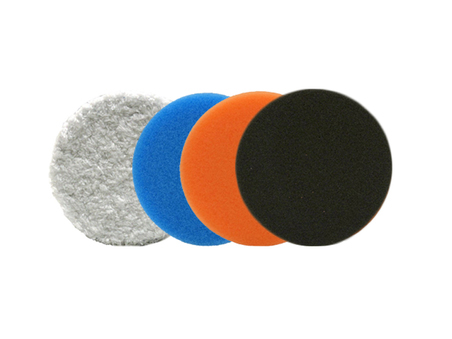 Blue Cutting HD Orbital Foam Pad - Firm, medium density foam for scratch and defect removal. Use this pad with polishes and swirl removers as an all around pad that will work on most light to moderate imperfections. Orange Polishing HD Orbital Foam Pad - Less dense foam formula for the application of cleaner waxes and light polishes. This pad has very light cutting power so it’s perfect for the removal of light defects and micro marring. Black Finishing HD Orbital Foam Pad - Super soft composition perfect for a flawless finish. With absolutely no cut, this pad will apply thin, even coats of waxes, sealants, and ultra fine glazes and will buff to perfection. Lake Country HD Orbital Foam Pad - 5.5"
Lake Country HD Orbital Foam Pad - 6.5"